Combine tomato, parsley, capers, wine, lemon juice, oil, garlic, lemon peel, salt, and red pepper flakes in large bowl; set aside. Cook pasta according to directions on package, omitting any salt or fat. After 6 minutes of cooking, add shrimp to pasta. Return to a boil and cook 4 to 5 minutes or until shrimp is pink and opaque. Drain well. Add to tomato mixture, and toss well. 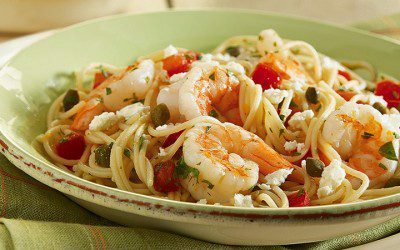 Place shrimp mixture in pasta bowl or place equal amounts on each of four dinner plates. Sprinkle evenly with cheese. Serving Suggestion: Serve with a quick sauté of fresh spinach and mixed greens with a light, creamy dressing. Exchanges per serving: 2 Bread/Starch, 1 Vegetable, 3 Meat.